Kastar 18650 (20-PACK) LGDBHG21865 High Drain (35A Max. current load) Lithium-ion Battery, HG2 3.6V 3000mAh Rechargeable Flat Top for Electric Tools, Toys, LED Flashlights and Torch ect. Kastar 18650 (20-PACK) LGDBHG21865 High Drain (35A Max. current load) Lithium-ion Battery, High Quality HG2 3.6V 3000mAh Rechargeable Flat Top for Electric Tools, Toys, LED Flashlights and Torch ect. High capacity - HG2 High Drain (35A Max. current load) 3000mAh high capicity quality will provide ultra strong power for your devices to performance well and operate longer. 800 Cycles - Add mix-protection additive to the cathode of batteries, protect the material from degradation in the progress of charge and discharge, extend lifespan up to 800 cycles. Low self-discharge - Embedded seal structure expand the space of crystal lattice, make more room for hydrogen, so this HG2 batteries will holds long time benefit from its concentration to low self-discharge project. Safety assurance - Lithium-ion eco-friendly cell, doesn't contain Hg/Cd/Pb, makes no pollution to the environment, and using High Quality steel shell which can protect the battery against explosion due to overpressure. Long warranty - The batteries include 30-day Money Back and 12-Month Manufacturer Warranty. Kastar INR18650 (20-Pack) High Drain (35A Max. current load) Lithium-ion Battery, 3.6V 3100mAh Rechargeable Flat Top Battery for Electric Tools, Toys, LED Flashlights and Torch ect. 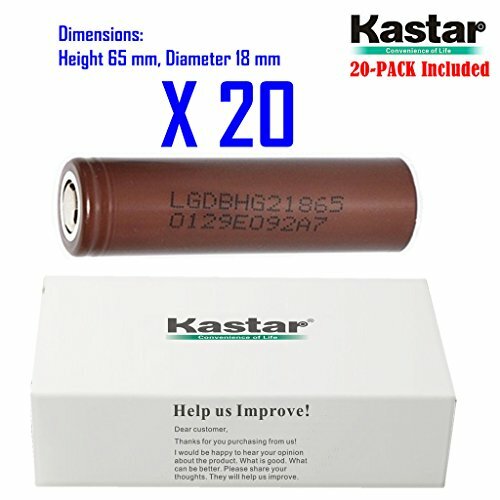 Kastar 18650 (20-Pack) NCR18650BE Lithium-ion Battery, Genuine Quality Rechargeable 3.7V 3200mAh Flat Top Battery. Kastar 18650 (20-PACK) NCR18650B High Drain Lithium-ion Battery, High Genuine Quality 3.7V 2900mAh Rechargeable Flat Top for Electric Tools, Toys, LED Flashlights and Torch ect. Kastar IMR18650 (20 Pack) High Drain Lithium-ion Battery (30A Max. current load) 3.6V 2800mAh Rechargeable Flat Top Battery for Electric Tools, Toys, LED Flashlights and Torch ect.